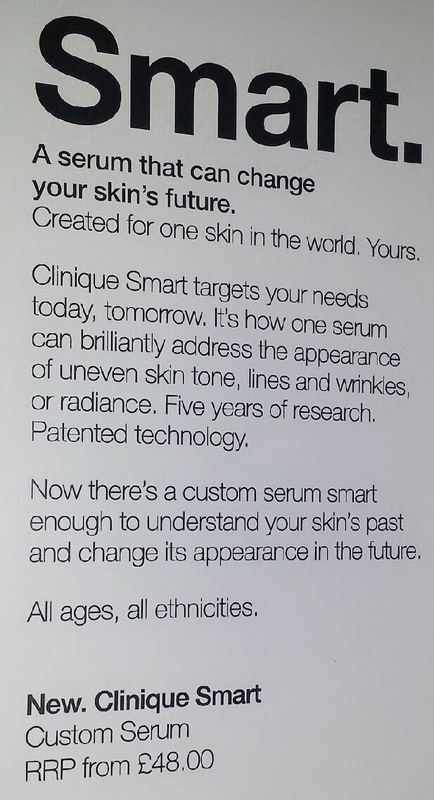 Clinique’s Smart Custom Repair Serum is a product that claims to be able to tailor itself to your skin type. Five years in the making, Clinique say that whether you have uneven skin tone, loss of firmness, wrinkles, fine lines or a combination of all or a couple of these concerns, this serum is supposed to be able to fix it. This cream is supposedly able to “sense” your skin issues and then it then activates the ingredients necessary to work with your skin. It’s a big claim and one that is pretty difficult to wrap your head around. How can a serum read your skin? I’m going to attempt to answer some questions about this product for you whilst also discussing the most important aspect - is it all it is bigged up to be? First thing’s first - let’s discuss the theory behind this. It is a pretty difficult thing to try to fully comprehend to be honest with you. Whenever I try to explain it, it just doesn’t sound real. It sounds almost as if I am talking about a cream with hidden technological bugs in it that crawl across your skin with tiny magnifying glasses, observing and healing each individual skin cell. That is NOT the case, obviously. When applying this cream, it is supposed to be able to “read” your skin. Where it comes across across a problem, it releases the relative ingredients to cure the issue. Where there is no issue, it carries on. I was pretty thankful to say the least that others share this train of thought, but that doesn’t mean that I dislike this product. 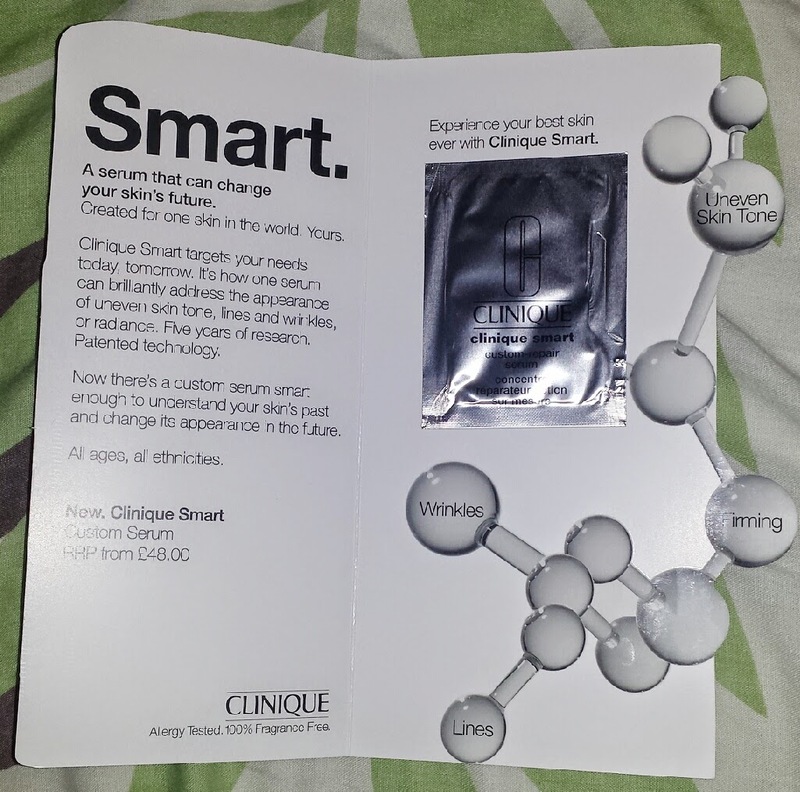 I acquired only a sample of the Smart Custom Repair Serum with a purchase of a different item at the Clinique counter. The sample only provided enough serum to last a few days, but I felt that it was long enough to report back some results. I think that after a while I could have learned a lot more about this product, but I feel that I learnt enough to form an opinion. The cream itself is a very pale peachy-pink shade, slightly watery but not too much so. It comes packaged in a silver tube that holds either 30ml or 50ml of product (or in my case, a small silver sachet attached to a funky card with an explanation of the product). The serum is very easy to apply. After toning but before moisturising (I used it at night time, so my moisturiser was my Night Detox), you apply a small amount of serum to the face. It spreads across the skin easily and absorbs quickly also. My skin issues mainly consist of the following: blemishes, oily, dark spots, uneven skin tone, visible pores, occasional dehydration. After the first night I did actually notice some slight differences. My skin tone was more even, but not much else had happened after night one. After two-three days though, I did notice more. Dark spots were decreased, my skin tone looked more even and yes, my skin did look a bit firmer. However - and here is the big one for me - I didn’t notice this product doing anything different or more spectacular than products that I have already used. For example, La Roche-Posay’s Redermic R is a big favourite of mine, and that fixes all of my skin issues at roughly half the price of the Custom Repair Serum. On the upper end of the price scale though, Lancome’s Visionnaire Serum also fixes these same issues for me. Maybe this is purely because I don’t have the other skin issues that are listed. I don’t yet have to deal with wrinkles and if my skin has too much radiance then I start to look like a glowing oil slick. That doesn’t give me a bad impression of this product, though. For my skin issues, it did help them and it did that well. Yes there are other products that can do the same for me for less, but let’s remember that this is a custom repair serum. It only fixed the issues that I had, not the issues that I don’t. Or so the marketing says. In truth, Redermic R is also an anti-wrinkle cream and Lancome's Visionnaire also helps with fine lines, too. But again, as I don't yet have this issue, I cannot make a judgement on whether the ingredients are trying to work on those non-existent issues on my face too. The point is that the ability to do those things is also carried within those products, but as I don't have the skin concern, do those creams also "read" my skin to dictate whether those ingredients need to come into play? Or do those ingredients simply just not effect my skin whilst the others do? If you suffer with a larger combination of these issues that the serum claims to repair, you may see more results than I did. It may also work out far cheaper for you too. You wouldn’t have to purchase multiple products to help cure each skin concern, but have one, trusty serum for you to use instead. If, however, you only suffer with one of the skin issues, you may be able to find a far cheaper product to repair just that alone. It is definitely down to whether you need a serum to repair a whole array of skin issues or whether you can be content with a serum that is only designed to target one or two problem areas. 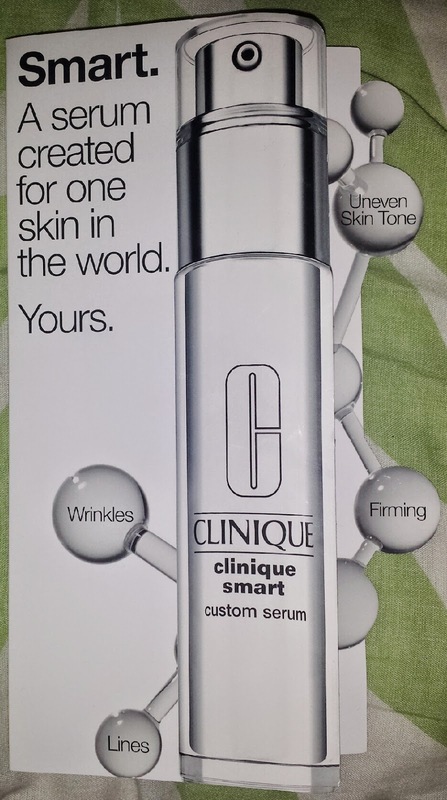 If you are interested in buying the Clinique Smart Custom Repair Serum, you can pick some up for £48 for 30ml and £68 for 50ml from Clinique, Boots, Debenhams, Selfridges, House of Fraser or John Lewis. Have you tried the new Clinique Smart Custom Repair Serum? What do you think about it? I’m not really a fan of serums but I’m interested to try this one. No-Poo - Ditching the shampoo & conditioner!